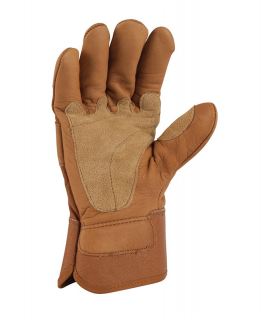 Few jobs are too tough for this rugged grain leather work glove. It's constructed Carhartt® strong in 100% cotton duck fabric with a full-grain leather palm. Suede palm and thumb patches improve durability, and a cowhide delivers knuckle protection. There's also the easy on/off convenience of a safety cuff and side vent.